Createspace Independent Publishing Platform, 9781469903491, 82pp. Reader Views Kids Award for Best Children's Book of the Year 2010 and Mom's Choice Gold Award Outstanding Young Contributor This is not your usual boy-meets-dog, boy-loves-dog, dog-helps-boy story. But then Morasha Winokur is not your usual eleven-year-old sister. "My Invisible World" cleverly exposes a hidden, completely preventable, public health crisis that impacts each of us. Up to 1 out of 100 live births are affected by prenatal alcohol exposure and it is the leading known preventable cause of intellectual disability. Fetal alcohol spectrum disorders (FASDs) are life-long birth defects. An individual may live with neurological, emotional, cognitive, and behavioral challenges. FASDs may be the most undiagnosed/misdiagnosed developmental disability of our time. Eleven-year-old Morasha shares her in-depth and personal life story of what it feels like to be the sister of a sibling that struggles with FASDs. "My Invisible World" is an incredible inside account of the daily issues that arise for a child that deals with an invisible brain injury. Winokur, describes her brother's disability with tween-humor and addresses her struggles in knowing she is mentally and physically healthy while her brother has special needs beyond her ability to fix. Morasha and her brother Iyal are non-biological siblings who were adopted by a loving couple and traveled from Russia to their new family's home in Georgia. Young Morasha shows her commitment to her brother's disability by sharing her inner-most thoughts in an effort to raise awareness in her peers so they too can understand the importance of not drinking while pregnant. As the "typical" sister, Winokur wrestles with the angst of whether or not it is better to remain translucent in her existence, or whether she should embrace the visibility that having a service dog in the family creates. Not only is an eleven year old boy's hidden disability validated by Chancer, a service dog - but the effort it takes for an entire family to support this person becomes perceptible. 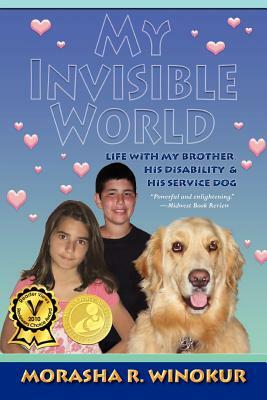 The unconditional presence and specifically trained skills of an irresistible 90 pound Golden Retriever help to heal not only Winokur's brother, but each member of the family in unexpected ways. "Whether you are learning to cope with a disability in your own family, or simply interested in reading a great book that shows immeasurable strength and courage, this is a must read - Melissa Lacquement' An honest and sensitive assessment of life for the sibling of a special needs child. Eleven year-old Morasha puts into words the burdens faced growing up with a brother affected by Fetal Alcohol Spectrum Disorder (FASD). The reader learns how the whole family embraces the challenges of living with an FASD child and finds support in a specially trained service dog, named Chancer. This book provides insight, and is an appropriate read, for any parent or sibling of a of special needs child - not limited to only FASD affected families. - J Michael Williams This is a great book to share with others, especially children. This book should be in every elementary and middle school library in the county. Morasha tells it like it is - J Liebman Heartfelt voice of a young sister's love and her own internal struggle of acceptance with her sibling's disability. Wonderful read for inspiring authors, siblings and parents. Wish elementary schools would use this book for their student's curriculum and writer's workshops. There are so many lessons embedded in this 11 year old Morasha's story: embracing diversity, empathy, self-acceptance, siblings, growing up, being an agent of change, and the importance of prevention. My son read it to me as his homework, but the lessons have only begun to start to take root. - Gailynn Gluth. Morasha's life in the United States began at 14 months when she was adopted from Russia by her parents, Donnie and Rabbi Harvey Winokur. As a toddler, Morasha created elaborate stories about her "former" life in Russia setting the stage for developing a vivid imagination and irresistible style of expression. At eleven years old, Morasha is in sixth grade at a public school in Roswell, Georgia. She lives with her parents, her brother, Iyal, his service dog, Chancer and two cats, Manhattan and Eilat.